What is a Menu and How Do They Work in Drupal? Website visitors use menus as a way to navigate and find what they are looking for on your site. Menus are most often located in the header, footer, left sidebar, or right side bar. You add menu items to give users access to a) the pages you build – highlighting and linking to information on your site, or b) external websites. There are three menus you will work with in GingerFeet: Navigation, Primary Links, Secondary Links. Depending on the GingerFeet theme you have chosen, you will have at least Navigation and Primary Links. Where menus reside on your website is determined by your theme or by you, but generally, the Navigation menu resides in the left or right sidebar, the Primary Links menu resides horizontally across the top and the Secondary Links usually drop-down underneath the Primary Links or are located in the left or right sidebar. There may be times when you add a page that you want to add to the menu structure at a later time. You can add a menu item at any time through the Administration Menu. In the Administration Menu across the top of your screen, select Site Building → Menus → List Menus. Click to select the category you want. A list will open showing all the Menu Items in that category. A new menu item form will display. Enter the menu item details. a. External links: To link to another website, enter the full URL of the external web page, for example http://www.abc.net.au. Click the Submit button to save changes. The new Menu Item now displays in your menu. Click the Edit link to the right of the menu listing. Edit the text in the Menu Link Title field. Click the Submit button to save changes. The edited Menu Item now displays in your menu. 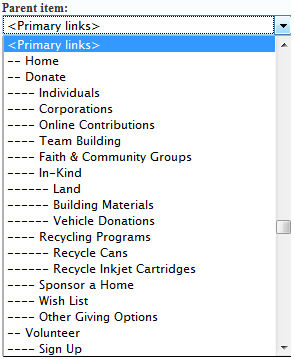 Select the Menu where you want the item to reside (either <navigation>, <primary links>, or <secondary links>). To change the position of the item within the menu, enter a weight in the Weight field. Numbers with a negative sign in front (-10) will float up toward the top of your menu list. Numbers with a positive sign in front (+10) will drop-down toward the bottom of your menu list. If you want to over-ride the alphabetical order of menu items, set the Weight by using the drop-down arrow and choosing a new setting. There are two ways to remove a menu item from view. You can either disable a menu item so that it is archived for future use, or delete a menu item for permanent removal. Always disable items first! Only delete when you are certain you want to delete. Disabled menu items are not deleted. They are just not available on the menu for public view. This means you can temporarily remove menu items without the need to delete and then enable an item if you want it to return. Click to select the category you want. A list will open showing all the Menu Items in that category. Uncheck the check box in the Enabled column. Scroll down to the page bottom of the page. Click the Save Configuration button to save your changes. This will temporarily disable your item. Deleted menu items are irretrievable. Disable a menu item if you are not positive that you want to remove it completely. In the Administration Menu across the top your screen, select Site Building → Menus → List Menus. Select Delete in the Operations column. Click the Save Configuration button to save your changes. You cannot recover deleted work.